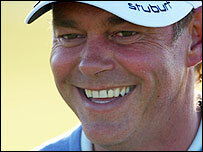 Far be it from us to suggest that Darren Clarke is not a superb fisherman. But knowing he is supposed to be a keen angler, we were slightly surprised to discover that he is staying right next to the fishing equivalent of a turkey shoot. We would be breaking all manner of confidences (and very possibly laws) if we revealed the exact location of DC's digs this week but we were expecting it to be near a raging river or languid loch, where the sport would be challenging and hearty. It is not. His house backs on to a large hole in the ground that has been filled with water and large, fat fish that would probably view being skewered through the mouth with a hook as a welcome release from their manor's overcrowding issues. DC, who has missed a few tiddlers of late, is clearly hoping that a few quick wins by the 'lake' can give him a shot of confidence for this week's main challenge. 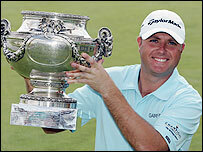 Speaking of confidence, England's Graeme Storm is currently, and justifiably, bubbling with the stuff. The former Walker Cup star turned pro in 2000 but then spent the next five years bouncing along the bottom of the Order of Merit. This meant four straight visits to qualifying school and winters working in a cream cake factory to make ends meet. That all started to change in 2005 when his results improved markedly. And his progress was rewarded with a first European Tour win earlier this month at the French Open. 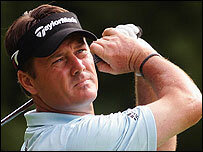 That win booked his place at the Open, giving the 1999 Amateur Champion another crack at Carnoustie. Back then he carded an 82 and a 79 to miss the cut by seven. Not great, but no worse than Vijay Singh and 11 better than Sergio Garcia. Storm 'walked' the course on Monday and played it this morning with Nick Dougherty, Justin Rose and a certain Nick Faldo. The fact that he is keeping such company these days is a source of satisfaction and surprise for the modest Storm. "I bumped into (very famous coach) David Leadbetter at the Scottish Open at the weekend and I was sure he wouldn't know me at all," Storm told BBC Sport. "But he did. And he was really nice, congratulating me on my win in France and saying that he thought I was coming along well." All of which is true. But it is still amazing how many good players out there need a win to convince themselves of that. Golf really is the ultimate confidence trick. It was probably unfair of us to pick on Boo Weekley (see below) for not knowing that Paul Lawrie won the Open the last time it was played here - there are many in this tent who saw it with their own eyes and still cannot quite believe it - as it was way back when Europeans still won majors. More surprising was the sight of 2004 'Champion Golfer' Todd Hamilton wheeling his own luggage through Edinburgh airport, trying to sort out a hire car and generally behaving like, well, the two of us. No bunting, no entourage, no nothing. The last man to win an Open other than Tiger Woods and nobody - in a Scottish airport - recognised him apart from us. We found it quite sad and wanted to bound up to him to say, "We know who you are and we're delighted to meet you." We didn't, though. He was in a queue to change some money, which we felt was a private matter. Spanish scamp Sergio Garcia was on his usual ebullient good form at the TaylorMade "Burner Night" at plush Piperdam Golf and Country club near Dundee on Monday evening. The young maestro was taking part in an informal Q&A alongside the likes of Justin Rose, Retief Goosen, Darren Clarke and Graeme Storm as a promotional shindig for his club makers. TV funnyman Vernon Kay, a recently converted golf nut, was master of ceremonies and asked a few questions of his own before turning it to the floor. Sergio went through his usual "pretending to fall asleep during Clarke's answers" routine - always a cracker, that one - so diary sensed there was some mischief to be had. Requesting the mic from one of the bevvy of "Bunker Babes", diary asked Sergio, "What has been your most embarrassing moment on a golf course?" Sensing he might need to be serious in front of his ironmongers, Sergio then launched into an earnest spiel about how pros practise so hard that when they leak a bad shot they feel silly. "It might not look like a bad shot, but to us, inside, it's very embarrassing," he said. Imagine, then, how embarrassing it must have been when, as a 19-year-old recently turned pro, touted as the next global golfing sensation, he amassed rounds of 89 and 83 to miss the cut at Carnoustie in 1999. When it comes to etiquette at the Open these days there is only one rule that really matters. Never mind having to wear long, diamond-pattern socks with tailored shorts on days with a y in them or needing a jacket and tie to get into the car park, the only taboo that is holding the line against encroaching vulgarity here is that thou shalt not get on the course before Tiger. Seasoned Woods watchers have long got used to the idea that whatever time you arrive during the practice days the world number one will already be on the back nine. This correspondent is convinced the American superstar sleeps on the course overnight in a tent with the greenkeepers (the latest on his "official" domestic arrangements are that he has either hired a house in Carnoustie - any ideas? - or is staying in St Andrews and helicoptering in... we prefer the tent idea). Tuesday's practice day was another confirmation of the natural order of things at majors. The first actual group on the schedule was the 0700 fourball of Aaron Baddeley, Markus Brier, Ben Bunny and Ryan Moore. If you had arrived at 0655 thinking you had got there in good time for the day's first action, you would have been sorely disappointed to discover that Team Tiger and his phalanx of outriders were already scorching a path up the 4th. This happens every year. Every other golfer scribbles their name down on a practice round list in the clubhouse the day before, Tiger comes in and writes his name on a new line at the very top. Superstar Americans don't do queues or waiting lists. Your diary team has long wished for a young upstart, or Rory Sabbatini, to come along and put his name at the top of the list after Tiger has added his new line. When we heard that American golf historian Boo Weekley asked 1999 Open champion Paul Lawrie at the Scottish Open this weekend if he had "qualified for Carnoustie", we thought we had found our candidate. Sadly, Boo has heard of Tiger and opted for a mid-morning start with Charley Hoffman... who we have never heard of before. Tiger's non-appearance on any official practice round schedule is not the only item of interest on (or in Tiger's case, not on) the provisional lists us hacks are given. A quick perusal of Tuesday's threw up the interesting prospect of two Vijay Singhs playing with David Frost at 1100, and not one, not two, not even three, but four Colin Montgomeries playing at 1630. 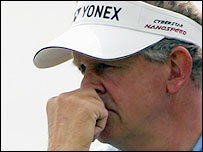 The Scot is a famously complicated and, dare we suggest it, moody character, so this is either his way of saying all facets of his personality will be on display this afternoon - happy Ryder Cup charmer, grumpy, hot and bothered - or it is actually going to be a "Guess the Real Monty" competition involving him and three blokes in slacks, v-neck jumpers and those David Gower wigs that everybody wore at St Andrews in 2005. We hope it is the latter. We will keep you posted.